Preheat your oven to 325°F. Spray 24 muffin tin cavities with nonstick cooking spray and set aside. In a medium bowl, add the graham cracker crumbs, melted butter, and sugar, and mix to combine. Portion a scant tablespoon of crumb mixture into each muffin tin cavity, and press down evenly with a spoon to create a thin crust. Repeat with remaining crumbs, then bake prepared crusts in your preheated oven for 5 minutes. Remove and let cool while you make the filling. In a large bowl with an electric mixer, or the bowl of a stand mixer fitted with the paddle attachment, add the softened cream cheese, blueberry cream cheese, 1 cup sugar, flour, and salt, and beat until thoroughly combined. Do not overmix. Add the eggs one at a time, beating after each addition. Add the sour cream and vanilla extract, and continue beating until combined. Gently stir in the blueberries with a rubber spatula, and then with a medium-sized cookie scoop, portion the batter over your cooled crusts. Don’t be afraid to fill the cavities completely — the cheesecakes will puff up during baking, but will sink a bit once they’ve had a chance to cool. Bake cheesecakes at 325 degrees F for about 20 minutes. The cheesecakes are done when the tops look set, and they jiggle slightly in the middle. Remove them from the oven, and let them sit in their pans until completely cool. Once cool, refrigerate until ready to serve. To serve, garnish with fresh blueberries (or any other berries you have on hand). A dollop of fresh whipped cream would also be delightful! 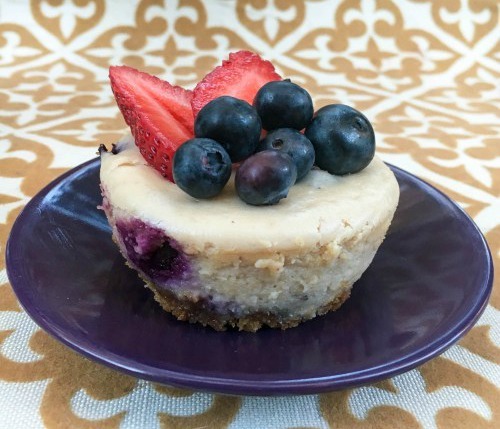 Recipe by Taryn of <http://www.sweetlyserendipity.com/dessert/cakes-and-cupcakes/mini-blueberry-cheesecakes/”>Sweetly Serendipity blog.